This entry was posted on 13 December 07 at 12:10 and is filed under China, Expat Life, Food. You can follow any responses to this entry through the RSS 2.0 feed. Both comments and pings are currently closed. Hee hee, the yumberry. How big are they? Thank you for writing about Yumberry. We have been working on this project for two years and are excited to finally have produced the juice in the U.S.A. and soon in Canada. 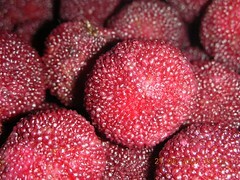 We are updating our website very soon with much more information on the Yumberry. Hi Terry, Thanks for that info. I’ll definitely try the juice the next time I’m in the US! Very interested in taste and odour profile of this fruit. Any descriptive terms you could give me would be great. Trying to source some of the juice to taste here in UK, you don’t know any UK retailers do you by any chance? I have the perfect domain name if there is anyone interested in selling this juice in the UK!